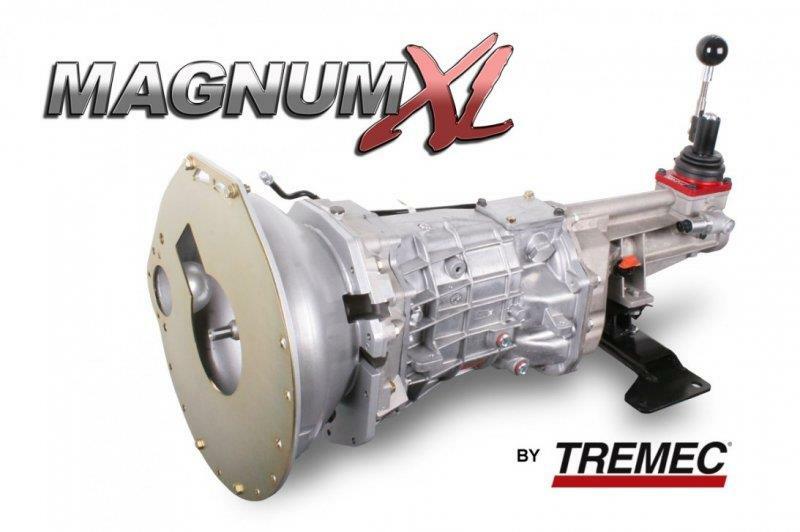 The newest addition to the Tremec line is theT-56 Magnum XL. The Magnum XL is a continuation of our revered Magnum 6-speed series. Featuring all the most important content from the original Magnum, the XL retains the Magnum’s brute strength and sophistication, but ditches it’s multiple shifter locations and dual speedo outputs in favour of a new “extended length” tail section designed to eliminate the clumsy “semi-remote” shifter found in many popular late model applications. Initially available for 2005- up “S197” Mustangs, the Magnum XL also includes a SFI-approved steel bellhousing, swapspecific crossmember and OE-quality mount. For strength purposes the Magnum XL requires a 26-spline clutch and one-piece driveshaft. These Tremec T-56 Magnum XL manual transmissions are purpose-built for the 2005 and later Ford Mustang. They include the shifter handle and knob, a crossmember, and a steel scatter shield. The transmission can withstand up to 700 ft.-lbs. of torque, with gears featuring substantially increased face widths and 2-piece laser-beam welded construction, allowing for greater control of the tooth angles, pitch, and alignment.